And Is Over 10,000 Miles Long?! 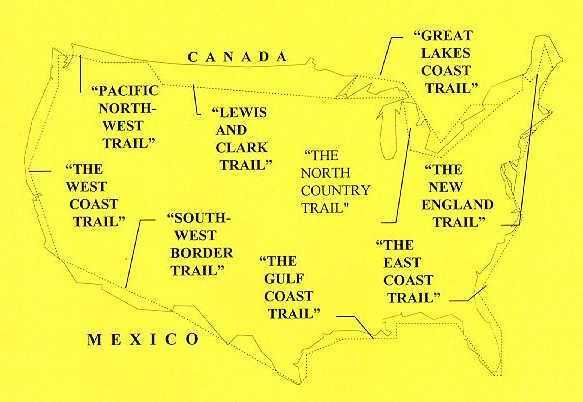 It's America's Longest Land And Water Trail -- A Recreation Trail For Hikers, Bikers, Kayakers, Canoeists, Wheelchair Users, and Horseback Riders, Cross-Country Skiers, and Others! It's Scenic Beauty -- A Diversity of Landscapes With Grand Forests, Sandy Beaches, Rocky Coasts, Rugged Deserts, Mighty Rivers, Snow-Covered Mountains, and The Shores of the Great Lakes, and Other Sites! It's History and Culture -- A Discovery Of America through Native Peoples, Lighthouses, Pioneers, Well-known People and Places, and More! It's The National Coast Trail!